Biddi making is a skilled job in which tobacco is rolled in a processed kendu leaf and tied with a cotton thread. The kendu leaves are moistened and then cut into pieces of required size and shape. Tobacco mixed with hand and then the processed tobacco is wrapped and rolled in the prepared cut piece of kendu leaf. The biddi workers work from morning (6 am) to 11 am and again from 2 pm to 10 pm. Some biddi factories were there at one time but now the factories are closed. Only a small group works together in some places. The airborne tobacco dust around the work places of biddi making units is the potential risk factors causing respiratory disorders to the biddi binders. The tobacco and the leaves were kept on the lap of the biddi binders and it is very much close to the nostrils and mouth. Besides these, different microbes and airborne fungal spores may be added into the working atmosphere from the processed kendu leaves. These are all the probable risk factors causing respiratory disorders among the workers. Keeping in mind the long-term exposure of tobacco dust exposure on lung function test of biddi binders, a follow-up study was conducted to verify the lung function changes after 2 years of exposure. In both male and female biddi binders, a validated questionnaire was administered and relevant information such as history of illness, was noted. Clinical examination was performed following standard procedures. This is a follow-up study after 2 years of the initial study. A total of 86 (male, 41; female, 45) biddi binders were followed up. The parameters of importance were compared with the initial study findings and the results are discussed in the following section. Only 86 biddi binders of initial study group had been followed up. So the present reporting compared the results of the initial study group with those of their follow-up study group. Pulmonary Function Test : The PFT was carried out by spirometric method. A total of 89 biddi binders (male, 43; female, 46) were studied. Vital capacity (VC) and forced vital capacity (FVC) was recorded by Spirovit SP-10 (Schiller Health Care Pvt Ltd., Switzerland) and Peak Expiratory Flow Rate by Wrights Peak Flow meter (Clement and Clarke, UK). 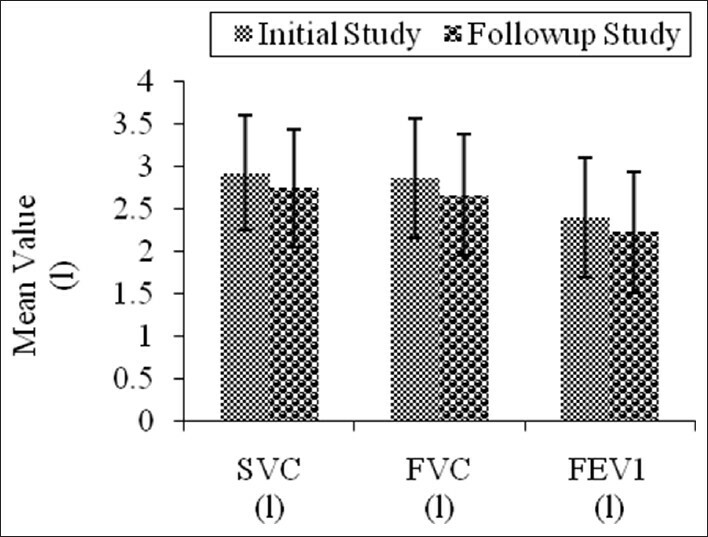 Forced expiratory volume in the 1 st s (FEV 1 ) and the 3 rd s (FEV 3 ), Forced expiratory volume in 1 st and 3 rd s as the percentage of FVC (FEV 1 % and FEV 3 %), forced expiratory flow at FEF 200 mL-1200 mL , FEF 25%-75% , and FEF 75%-85% was calculated from the tracings. The subjects were well motivated thus ensuring recording at optimum levels. The PFT measurements were made in a comfortable standing position. The body height and body weight were measured with a standard scale without footwear. All measured lung volumes obtained was expressed in body temperature pressure saturated with water vapor (BTPS). Body surface area (BSA) was calculated from the Du-Bois and Du-Bois  formula. PFT values were predicted from the standard prediction equation of the Kolkata normal subjects. The criteria followed for categorization of the severity of restrictive impairment are based on the ratios between predicted and observed values of VC and obstructive impairment based on FEV 1 %. The average age of the male subjects of the initial study and the follow-up study were 49.66 ± 9.88 and 51.54 ± 10.54 years and 36.09 ± 9.34 and 38.34 ± 9.67 years for females, respectively. The mean age of the total population male and female combined at the initial study is 42.04 ± 12.03 and the follow-up study is 44.63 ± 12.03. Their mean height and weight of the first study (initial study) were 155.41 ± 7.61 cm (male, 161.02 ± 6.50 cm; female, 151.29 ± 4.41 cm) and in the follow-up study were 155.49 ± 7.34 (male, 160.42 ± 6.81 cm and female 151.00 ± 4.34 cm); similarly the weight in the initial study was 47.71 ± 9.16 kg (male, 50.88 ± 9.78 kg; female, 44.82 ± 9.16 kg) and in the follow-up study, the mean weight was 49.44 ± 9.31 kg (male, 52.93 ± 9.94 and female 46.26 ± 7.47). The general symptoms as reported by the subjects are presented in [Figure 1]. It may been seen that the high prevalence rates of weakness, giddiness, chronic diarrhea, and dyspepsia were noted in both initial and follow-up study groups irrespective of gender. The above complaints were relatively more in the follow-up study. 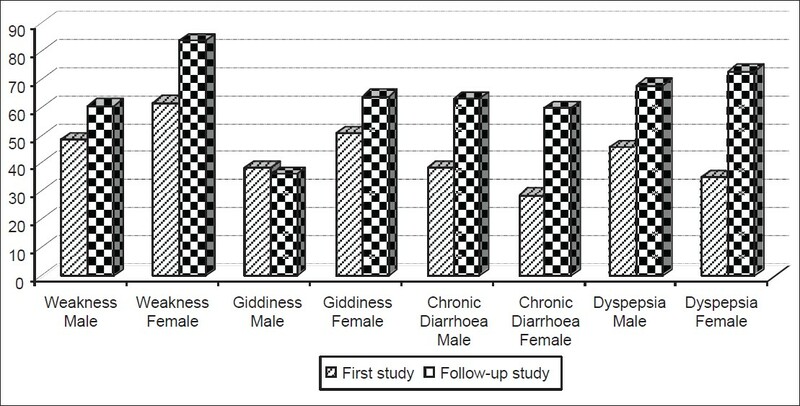 The symptoms of chronic diarrhea and dyspepsia in the follow-up study group showed significant increase at various levels (P < 0.05; P < 0.005; P < 0.001) both for male and female. 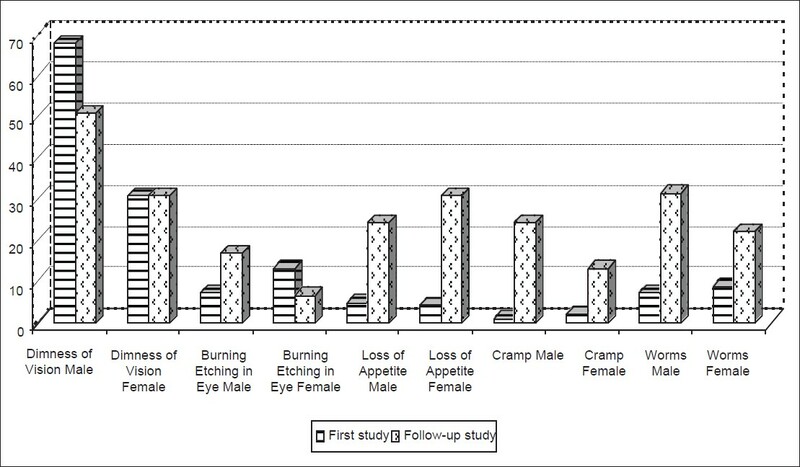 The symptom of burning sensation during passing of urine was significantly more in the follow-up study group (both male and female) compared with the initial study group (P < 0.01; P < 0.001). The distribution of respiratory symptoms as reported by the subjects of both the initial and follow-up study groups is depicted in [Figure 2]. A high prevalence of respiratory complaints such as cough, sputum, breathlessness, and chronic bronchitis was reported in both the initial and follow-up studies. However, there was a general decline in the rates of all the complaints in the follow-up group. The distribution of symptoms related to musculoskeletal system in the initial and follow-up studies is summarized in [Figure 3]. Pain in neck, joint pain (knee and shoulder), and low back pain were showing very high both in the follow-up and initial studies. However, the above-reported symptoms were more in the follow-up study group. Typical posture of biddi rolling might be the most probable cause of these ailments. Repetitive movements of the hands and awkward postures may also be responsible for causing the above-mentioned symptoms. Similar types of observations were also noted by NIOH. , A substantial number of subjects in both the follow-up and initial study groups complained of peripheral neuropathy. 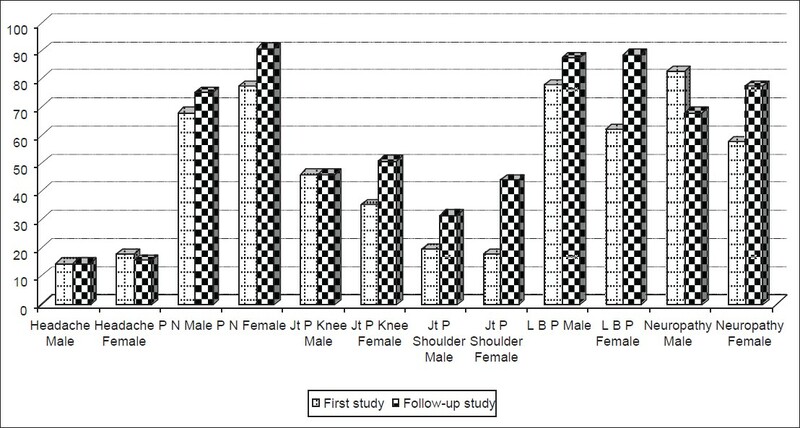 Although the prevalence rate of peripheral neuropathy (tingling, numbness, burning sensation, and weakness of limbs) in males in the follow-up study group (68.3%) was less than that in the initial study group (82.9%), but in females the follow up study group (77.8%) showed significantly higher rates (P < 0.05) than in the initial study group (57.8%). Other important symptoms, such as burning and itching of eye, dimness of vision, loss of appetite, feeling of cramps, and others, are given in [Figure 4]. Loss of appetite and feeling of cramps of males of follow-up study showed significantly higher rate compared with that of male subjects of initial study (P < 0.001, P < 0.05). Similarly, significantly more number of females complained loss of appetite and feeling of cramps in the follow-up study (P < 0.001; P < 0.05). It is a matter of concern that the overall complaints of worm infestations has increased to 26.7% from 10.5% of the initial study. As usual thread worm/pin worm, was the main type of worms that infected them and are significantly more in the follow-up study group compared with the initial study group (P < 0.01). The distribution of angular stomatitis and glossitis showed lower rates in males in the follow-up study than that of the initial study group. Females showed a higher rate of pallor and angular stomatitis. Hypertension [blood pressure (BP) >140/90 mmHg] was observed in 5.8% subjects in the follow-up study (male, 4.9%; female, 6.7%). Only systolic hypertension (systolic BP >140 mmHg) was noted in male -12.2% and female - 8.9% compared with initial study male -2.4% and female -4.4%. Diastolic hypertension (BP >90 mmHg) was observed only in the follow-up study. Most of the signs and symptoms may be related to their work methods, handling of tobacco dusts, and likely due to nutritional deficiency. [Table 1] represents the physical characteristics of the Biddi binders of the follow-up and initial studies. In the follow-up study, the same biddi binders (male and female) were studied after an interval of about 2 years. The mean value of age, weight, BSA, and body mass index in males was found significantly higher in the follow-up study compared with the earlier initial study results. Similarly in females, age, BSA, and body mass index were significantly higher. 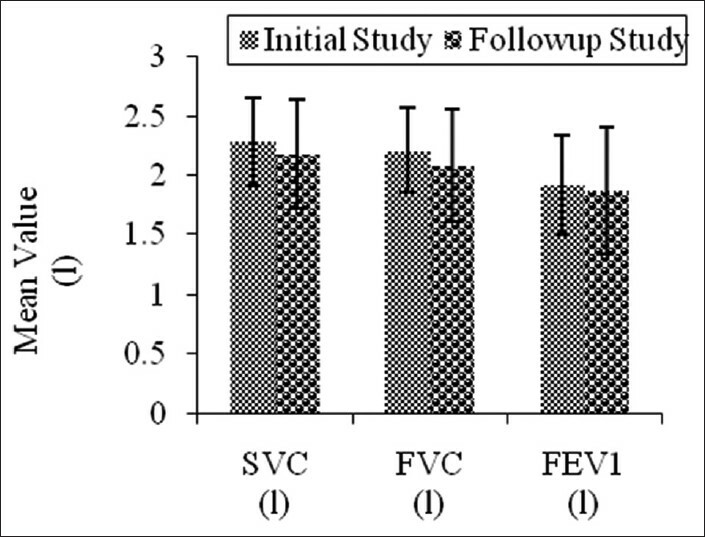 Pulmonary function test values of the male and female biddi binders of both the studies presented in [Figure 5], [Figure 6], [Figure 7] and [Figure 8] show the relative significant decline of the lung volumes SVC, FVC, FEV 1 and the flow rates FEF 0.2-1.2 l , FEF 25%-75% , FEF 75%-85% in male and female biddi binders in the follow-up study (P < 0.05, P < 0.01, P < 0.001). 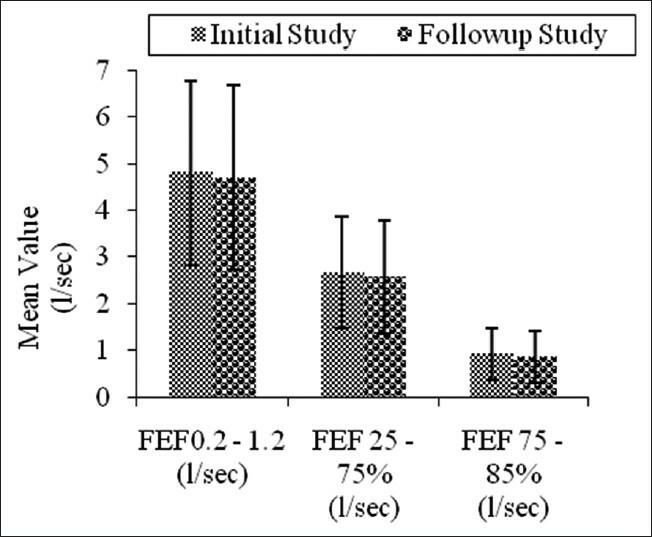 The PEFR levels had no significant change in males and females between the initial and follow-up studies. The male and female biddi binders were divided into the following age groups as 20-29 years, 30-39 years, 40-49 years, 50-59 years, 60-69 years, and >70 years. All lung volumes and the flow rates gradually declined with the advancing age in both initial and follow-up studies. 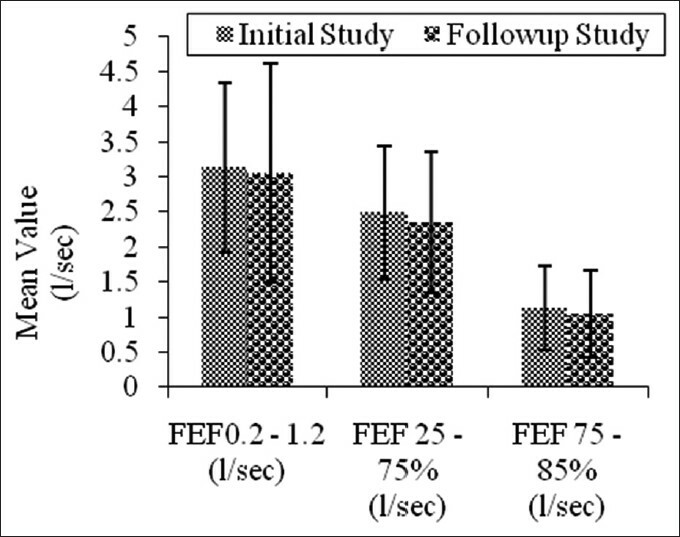 As the male biddi binders were categorized as nonsmoker, smoker, and exsmokers according to their smoking habit, their PFT values were found to be less in the follow-up study as compared with the initial study. The nonsmoker has the higher lung volumes and flow rates compared with smokers and exsmokers. Bronchodilator drugs (BD) were generally sympathomimatic agents that actively enlarge the lumen of bronchioles by effect on bronchodilator smooth muscles and enlarge the lumen of the bronchioles to ease obstruction. These drugs are widely and effectively used to test the reversibility of airways obstruction. The drug can be administered systemically in the form of aerosol. For each individual, the PFTs were performed after 30 min of bronchodilator use. A dose of 200 mg was delivered in the form of a "puff" to get the optimum results. After the maximum expiration up to the RV, the mouthpiece of the inhaler was placed well into the mouth and lips close firmly around it. Then the subjects were asked to inhale deeply through the mouth while activating the nebulizer. After holding the breath for a few seconds, the mouthpiece was removed and the patients were asked to inhale slowly, this procedure was repeated once. The bronchodilator aerosol used in the present study, which contained 100 ΅g of drug, was used in one puff and two puffs of the drug and was administered to each subject after and before bronchodilator PFT. After 30 min of bronchodilator administration, the postbronchodilator PFT was done. The peak effect of this drug occurs after 30-40 min of inhalation. The action of single oral dose of single inhalation lasts for about 4-6 h.  The workers were directed not to take any bronchodilator drug at least 24 h before the test. 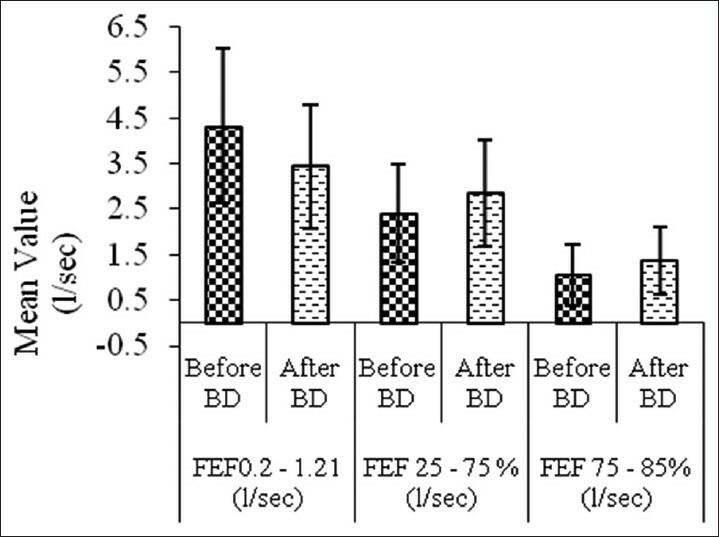 The bronchodilator aerosol was administered to the biddi binders after the completion of the initial PFT, a gap of about 30 min was given before and after bronchodilator was administered. PFT values are given in [Table 2] and [Table 3]. The mean difference of lung volumes after the bronchodilatation showed significant difference in all PFT parameters both in male and female biddi binders. 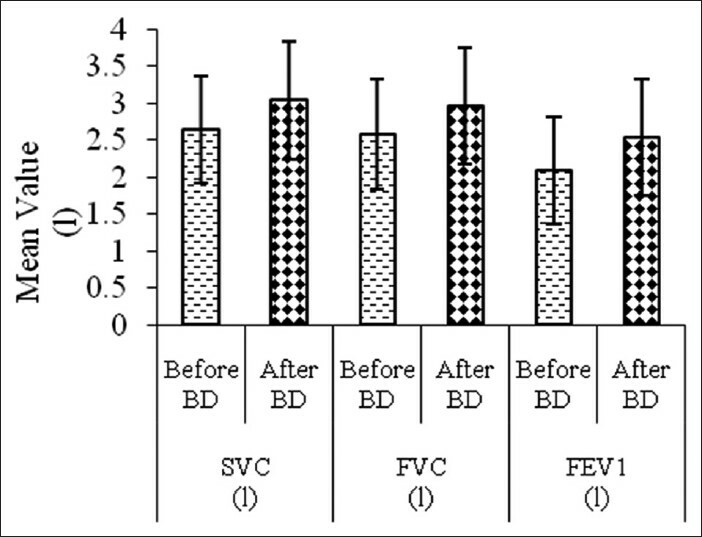 The positive bronchodilator response was defined for FEV 1 and FVC as an increase of >12% of baseline value and 200 ml according to ATS  criteria. 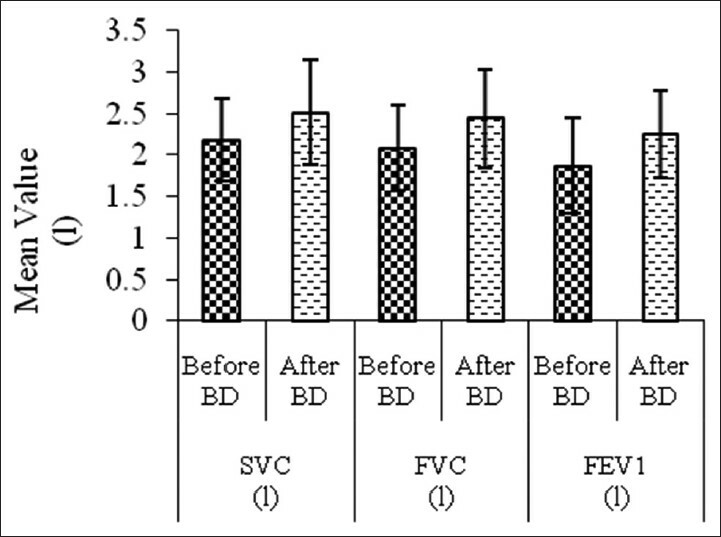 The criteria of positive bronchodilatation were fulfilled by SVC, FVC, FEV 1 , and inflow rates of male biddi binders. 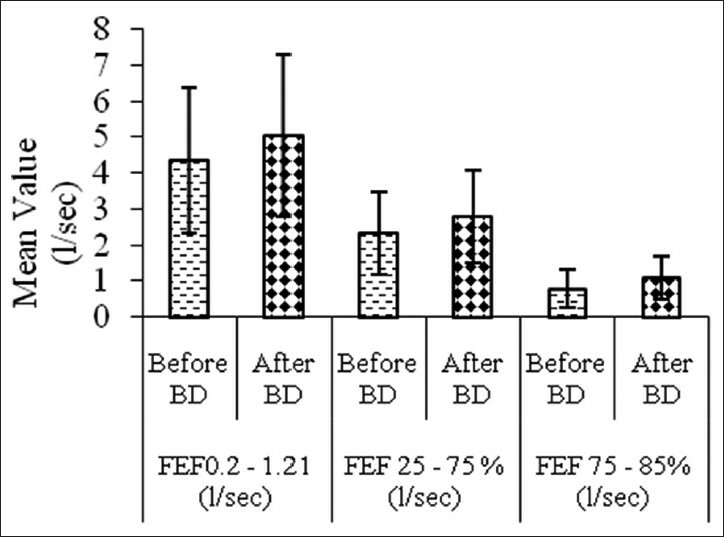 In female biddi binders, the positive bronchodilatation was found in all these parameters such as male biddi binders except FEF 0.2-1.2 L . The mean difference of the values between the before bronchodilator and after bronchodilator use was significant except in few of the flow rates. Sulbutamol bronchodilator aerosols are widely used to judge the reversibility of the airways obstruction present or not. Biddi binders are exposed to tobacco dust, which effects their respiratory functions. Comparison of initial and follow-up studies provides evidence of relative increase of the prevalence of various ailments as well as PFT values, irrespective of gender and age group after continuation for 2 years of exposure in the same occupational activity. Administration of bronchodilator drug could inevitably bring positive bronchodilatation and easing of airway airway resistance of the biddi binders indicating the obstruction in the airways might be reversible in nature. The investigators are grateful to the Department of Science and Technology, Govt. of West Bengal, for the sponsorship and financial support to carry out this important project. Thanks are due to the Anchal pradhans of Mograhut Gram Panchyat south and north for their kind co-operation in the study. Active participation by the biddi binders in the study is highly appreciated. Cotes JE. Lung function assessment and application in Medicine. 3 rd ed. Oxford: Blackwell Scientific Publication; 1976. Du-Bois D, Du-Bois EF. Clinical calorimetry. A formula to estimate the approximate surface area if height and weight be known. Arch Intern Med 1916;17:868-1. Annual Report 1980b, National Institute of Occupational Health, Ahmedabad,-Occupational Health survey of Women Workers engaged in Biddi making (rolling). Annual Report 1983-84, National Institute of Occupational Health, Ahmedabad, -Occupational Health survey of Women Workers engaged in Bidi making (rolling:1983-84, p. 78-86. Satoskar S, Bhandarkar SD. Pharmacology and pharmacotherapies. 7 th ed. Bombay, India: Popular Prakashan; 1980. p. 210-86. Crofton J, Douglas A. Respiratory diseases. 4 th ed. Blackwell: Blackwell Scientific Publications; 1997. p. 697-8. Gilmal AG, Goldman LS, Gilman A. The Pharmacological basis of Therapeutics. INC New York: Macmillan Publishing Company; 6 th ed. 1982. p. 166-8. Lung function testing: Selection of reference values and interpretative strategies. American thoracic society. Am Rev Respir Dis 1991;144:1202-18. Gilman AG, Goodman LS, Gilman A. The pharmacological basis of therapeutics. 6 th ed. New York: McMillan Publishing Company Inc; 1982. p. 166-8. Pierson RN Jr, Grieco MH. Isoproterenol aerosol in normal and asthmatic subjects. Am Rev Respir Dis 1969:100;533-41. Astin TW. Reversibility of airways obstruction in chronic bronchitis. Clin Sci 1972;42:725-33. Sobol BJ, Emirgil C, Waldie JR, Reed R. A response to isoproterenol in normal subjects and subjects with asthma. Am Rev Respir Dis 1974;109:290-2. Widdicombe JG. Regulation of tracheobronxhil smooth muscle. Physiol Rev 1963;43:1-37.